Naomi Wark is a life-long resident of Washington State. She lives on Camano Island on beautiful Puget Sound. When not writing, Naomi enjoys all the beauty which the island offers. She is both inspired and distracted by the beauty of the sound, the wide array of birds, including eagles, hawks, and hummingbirds, exploring the many parks, and kayaking. 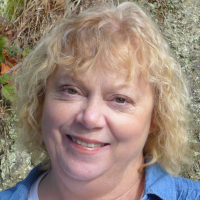 She is a member of the Skagit Valley Writer's League who keep her focused on her craft. She is also involved with several volunteer efforts which include, the local food bank, and the Society of St. Vincent de Paul where she is working with a group focusing on helping to eliminate homelessness in the North Sound region. She enjoys time with family and friends and particularly her two grandchildren. My novel, "Wildflowers in Winter: Aging with Alzheimer's" is available on amazon as either an eBook or a paperback.